New York television reporter Lucinda Trout is in search of greener pastures. Her self-imposed mission: move to the slower-paced, friendly, and vastly more affordable midwestern town of Prairie City, USA. Her search includes but is not limited to: a decently sized apartment with a few aesthetic qualities; a job that is not all about pleasing her conniving, urban terror of a boss; the love of a good man; and, maybe, a dog. And so Lucinda departs with a plan to deliver televised reports to her New York audience about the sweeping landscapes, charming farmsteads, and quirky locals that will constitute her newfound quality of life. Meghan Daum brings her sharp wit and courageous social commentary to a wickedly funny, unforgettable debut novel—one that is redemptive, witty and heartbreaking all at once. 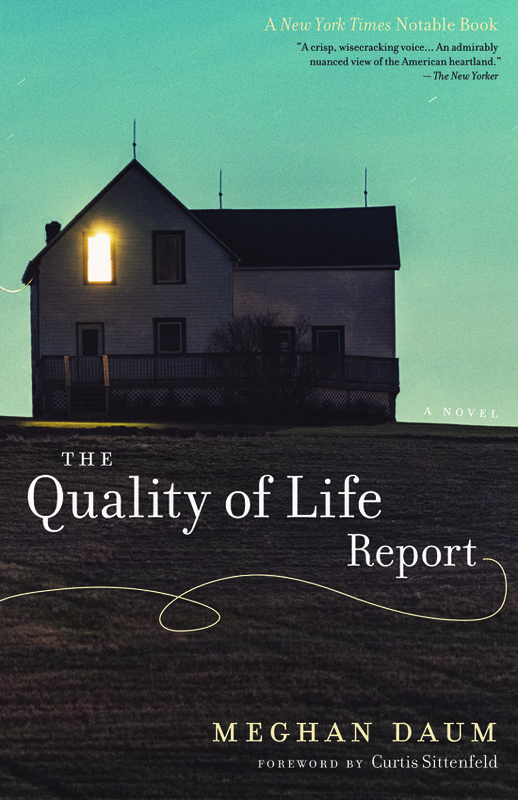 Review of The Quality of Life Report in The New York Times Book Review. Available at Amazon, Barnes & Noble and Powell's Books.